The Eminem Show flits between reflections on Eminem’s turbulent personal relationships and his tempestuous place in the music industry, and “Till I Collapse” is his personal anthem. Featuring Nate Dogg and sampling the stomp-stomp-clap beat from Queen’s “We Will Rock You,” it’s a song about how Eminem feels about his own music. Yet this track resonates with a lot of people — it’s been streamed more than 400 million times on Spotify and has held the top spot on workout playlists for years now. Maybe listeners read something else in the lyrics, or perhaps, propelled by the driving tempo, they use it as their own personal power track when repping the kettlebells. Are they devoted fans who’ve been waiting with bated breath at the weight rack for a glory-drenched comeback? Or are they exercise clichés who also run up steps while listening to “Eye of the Tiger”? “When I’m lifting, the last thing I want is anything too upbeat or poppy, so anything by Eminem works great for helping to maintain focus, get a little aggressive, and keep pushing myself,” U.K.-based personal trainer Mike Samuels said. Samuels is not alone, as Eminem’s been linked to athletic performance for some time now. In 2015, researchers at Hartpury University in the U.K. found three of Eminem’s tracks — “Lose Yourself,” “Not Afraid,” and “Without Me” — could improve athletic performance by 10 percent. During the 2016 Rio Olympics, the most decorated Olympian of all time, Michael Phelps, revealed Eminem was on his warm-up playlist. In 2014, Karageorghis and his team partnered with Spotify to come up with the ultimate workout playlist. Comprised of tracks that motivate and are proven to make you work harder, Eminem’s Rihanna-featuring 2013 hit, “The Monster,” was on the list. According to the research, at 110 BPM, it’s an ideal musical accompaniment to strength training. It makes sense: The majority of the people interviewed for this story said that Slim is best for soundtracking weight lifting. There’s even an adage in bodybuilding to “lift heavy, listen heavy” with forum posts and SoundCloud accounts curating rap and heavy-metal playlists specifically for lifting. Famous bodybuilders, including Dwayne Johnson, a.k.a. the Rock, have said Eminem is their favorite rapper. And Eminem himself told Men’s Journal that he dabbled in bodybuilding when he was in recovery for drug addiction. But not everyone listening to him at the gym is actually that bothered about Marshall Mathers the artist. Brazier said while he loves listening to Eminem while he’s lifting, that’s where his devotion stops. “It’s a relationship between Eminem and the gym for me,” he said. This gets to the heart of what’s so appealing about Eminem as workout music. There’s something uplifting in the dark world he creates. 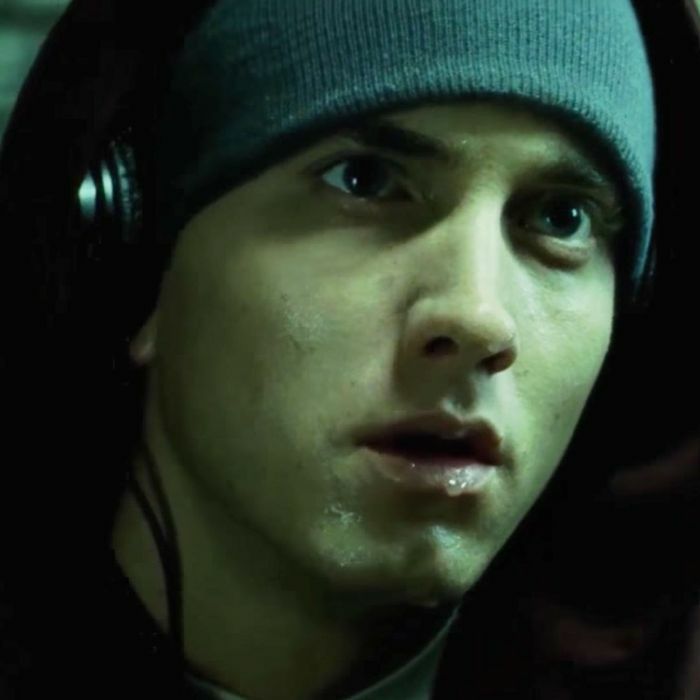 At face value, it’s straightforward: People can relate to Eminem’s viewpoint and emotional state, which happens to be set to the perfect tempo for lifting (or, in some cases, running). But for a few others, it also operates on another level. Eminem is a macabre writer. His music is the soundtrack for processing life’s dullest blows — while some do that at home, alone in the dark, others use his music to lift their way through the pain.